'Crazy Rich Asian's actress Fiona Xie hit the grey carpet on Sunday(January 27th) for the 25th Screen Actors Guild Awards at the Shrine Auditorium and Expo Hall in LA. 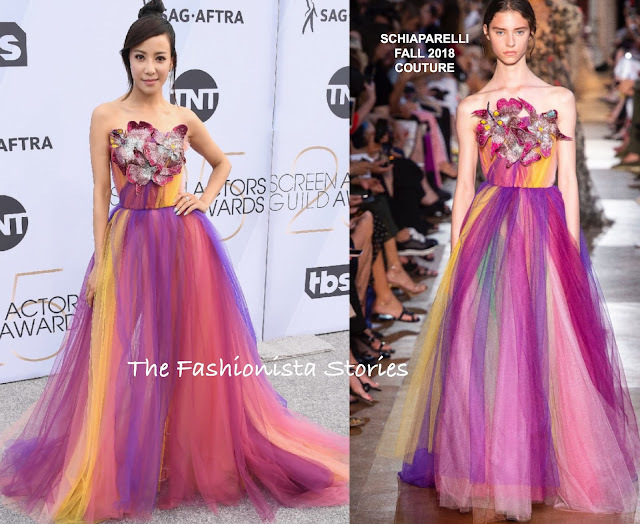 The actress could not be missed wearing this SCHIAPARELLI FALL 2018 COUTURE strapless yellow and lilac tulle embroidered layered dress with iridescent exotic flowers on the bodice. Allowing nothing to distract from her playful, colorful dress, she went with a light make-up look and a topknot, with a side swept bang. HEARTS OF FIRE jewelry and STUART WEITZMAN sandals rounded out her look.